As decorative lighting is part of our overall home decor, it is important to make sure we have the best bulbs in our fixtures. Here are the top ten decorative light bulbs on our site, each with their own characteristics that make them great. This B11 gold swirl antique light bulb creates a warm glow, reminiscent of 20th century lighting. It is made of gold frosted amber glass with a hand-wound tungsten filament inside of it, magnifying its vintage appeal. The intricate design of the lamp allows the bulb to be shown, adding distinction to your decorative light fixtures. Because it operates at 20 watts, this antique bulb creates a soothing light, ideal for night time lighting! Bring a rich ambiance to your interior design with the 12.5-watt CA11 golden smoke flame antique bulb! The decorative incandescent lamp is created from hand-blown amber glass and has a bent tip that sits on top of it, enhancing the lamp’s candle-like appearance. The candelabra base and gold frost finish make this bulb perfect for decorative chandeliers. For a romantic atmosphere, try this golden smoke vintage bulb! With aurora colored glass, the Satco S3369 F15 bulb adds sparkle to your chandelier. The decorative incandescent lamp operates at 40 watts and is rated for an average of 1,500 hours. It features a medium (E26) base, offering you the freedom to use it in a variety of lighting applications. Give your chandelier the stunning touch it needs with this aurora-finished lamp! If you want something unique, try the Bulbrite 411006 S6 frosted silicone tip bulb! The bulb has a flame-like appearance, adding a dramatic effect to your hall lighting. It operates at 6 watts with a life expectancy of 1,500 hours. The silicone covering makes the bulb shatter-resistant, assuring the bulb’s durability. With a distinctive appearance, this candelabra lamp is perfect for your decorative lighting needs! Starting at only $9.98, the 3-watt Archipelago decorative torpedo is an ideal choice for high chandeliers and sconces. The long life makes it perfect for hard to reach fixtures, as less maintenance is required. This driverless, bent tip LED bulb has a candelabra base and replaces a 25-watt incandescent lamp. Give your decorative lighting a longer life with this decorative LED torpedo bulb! If you prefer decorative globes to torpedo bulbs, try this Archipelago G16.5 LED globe! Perfect for indoor and outdoor use, the 3-watt globe has a 2700K color temperature and replaces a 25-watt incandescent. It has a long life of 50,000 hours and is CSA listed for use in wet locations (enclosed fixtures only). Whether it’s used in a hall chandelier or an outdoor lantern, this decorative globe is sure to give off a beautiful white light throughout its lifetime! The Bulbrite 410303 CA5 flicker flame bulb imitates the flicker of a real flame. Operating at 130 volts, the decorative incandescent lamp has a rated life of 2,500 hours and features a candelabra base. The bulb can be used indoors or out, adding ambiance to your decorative lighting. For an authentic look in your sconce, lantern, or chandelier, try the Bulbrite flicker flame lamp! Embellished with a yellow tip, the Satco S3243 petite CA5 frosted bulb is brings a splash of color to its surroundings. The bent tip bulb has a brass candelabra base and is rated for a 1,500 hour life. Add a colorful and nostalgic touch to your decor with this Satco yellow tip bulb! For other colors, be sure to visit our colored decorative bulbs category! If CFL bulbs are your preferred choice for lighting, this TCP 10714C-51K torpedo CFL bulb is the way to go! Great for indoor and outdoor use, it operates at 14 watts and has an average life of 8,000 hours. The 5100K color temperature creates a bright, white light, equivalent to a 60-watt incandescent lamp. With a candelabra base, this lamp is perfect for chandeliers, lanterns, and more! Part of the InstaBright family, the 4-watt TCP 1G2004C G20 CFL globe bulb is a wonderful replacement for 25-watt incandescent lamps. The 2700K bulb reaches full brightness faster than other CFLs, enhancing its overall performance. 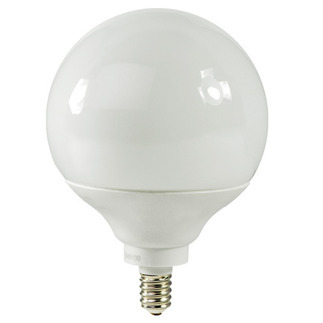 For a bright, energy efficient lighting option, choose the TCP CFL G20 globe! Have you used any of these bulbs? Send us your pictures or let us know what you think of them on Facebook, Twitter, or Google Plus!